Anyway, I think it’s a “mouthfeel” thing for me. When I eat quinoa, I can’t really distinguish it from just gobbling down a spoonful of air. There’s just nothing really to quinoa – it’s just too fluffy and airy to be considered a reasonable side for a meal. It has a decent flavor, and the health benefits are like, woah impressive; however, I’m not akin to this super-popular superfood. Am I the only one out there? I’m sorry if my admittance of disliking quinoa has made me immensely less hip. My aversion to this wünder-seed has inspired me to create a recipe in which quinoa is actually tasty. And I have succeeded; quinoa fricken rocks in this Coconut Coffee Cake Granola. 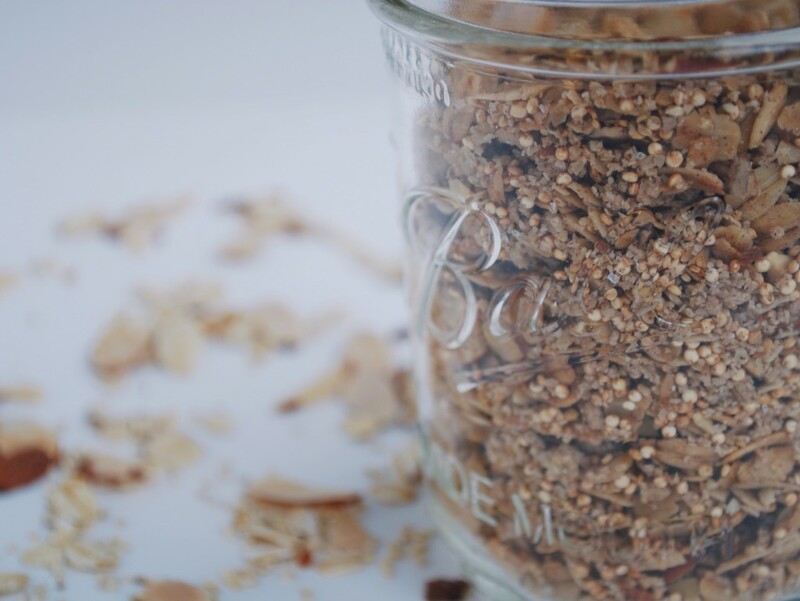 Complete with an oat crumble topping, this granola almost resembles a museli, making it the perfect accompaniment to a cold bowl of almond milk. It’s crunchy. It’s slightly sweet. It’s crumbly. It’s a sound breakfast or snack. It’s healthy and crazy flavorful. Now, let’s get oaty. As with any granola, oats act as our base. Rolled oats pretty much act as a base for my life, anyway. I just adore oatmeal. There’s something magical that happens when you add heat to these tiny grains; they get all toasty warm and incredibly satisfying. Not to mention that the oat touts an admirable ability to lower cholesterol. There really isn’t anything better than a spoonful of oaty goodness. Coconut oil acts as part of our binder in both the granola and the crumble. I used unrefined coconut oil, which guaranteed a coconut-perfumed granola with slight tropical taste. Hey, we’re getting a giant snow storm in Pittsburgh tonight; I’m dreaming of a not-white beach right now. Some studies show that coconut oil helps with weight control and increasing one’s metabolism. A rich coconut flavor with nutritional benefits? I’ll take it. We need a little sweetness in this granola party, and what’s better than the comforting love of maple syrup? This liquid gold has such a distinct and warming flavor, but I understand that it can practically cost you your soul at the store. You can totally use honey if maple syrup is a little too rich for your britches. Whichever sweetener you choose, we’ll add just enough to kiss the granola with a tiny bit of dulce – we’re not going for cloying here. This ain’t no dessert. To enhance the coziness of the maple syrup, and to play on the coffee cake theme here, we add a little cinnamon to the mix. Pure perfection in a brown powder form as far as I’m concerned. 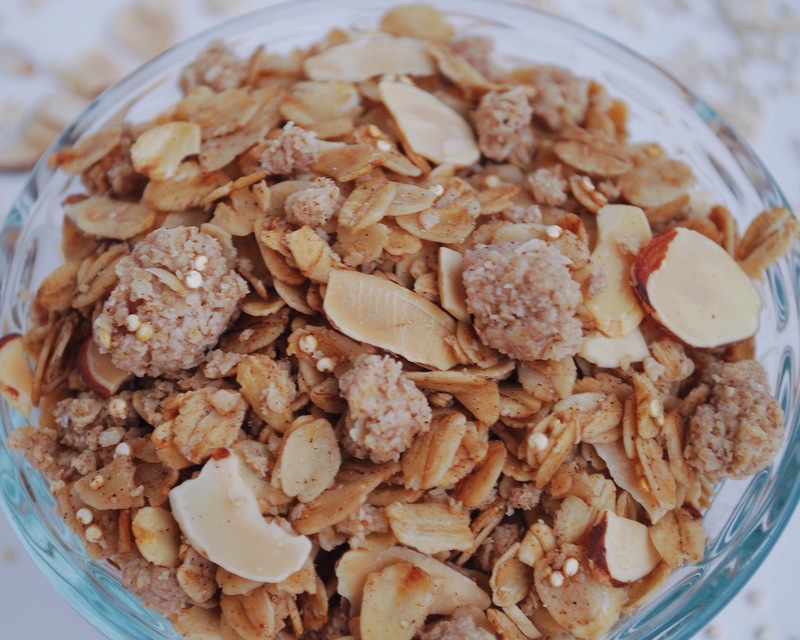 In this granola, I’m lovin’ the quinoa.This seed is high in protein and fiber, and as it toasts, it gets nuttier in flavor and gives this granola an irresistibly unique crunch. I may not be a quinoa advocate quite yet, but I may just come around to the hype via this tasty granola. Last, I like to add even more crunch through the addition of some nuts. I have already demonstrated my devotion to nuts multiple times on fooduzzi; fulfilling, full of protein and healthy fats, über crunch factor, nuts are one of my favorite foods. I opted for sliced almonds; however, any kind of nut you choose would be down-right delightful. This recipe makes a fairly small batch because I always find it difficult to finish all by myself while I’m at school. Feel free to double or triple the recipe if your granola monster is in full-force though. Your house will smell like a buttery rich dessert as you pull the pan of this Coconut Coffee Cake Granola from the oven, when it’s really full of fiber, nutrients, and protein. Ah, life is good. Your house will smell like a buttery rich dessert as you pull the pan of this Coconut Coffee Cake Granola from the oven, when it is really full of fiber, nutrients, and protein! This naturally gluten free and vegan mix will satisfy that summertime yearning! Make the crumble: Blend quick oats in a small blender or food processor until a fine flour forms. Place oat flour in a small bowl. Melt 2 Tbsp. coconut oil, then add to oat flour. Add 1/4 tsp. cinnamon, 1 tsp. maple syrup, and a pinch of salt. Stir until clumps form. Set aside. Make the granola: Preheat the oven to 325 degrees F. Line a baking sheet with parchment paper. 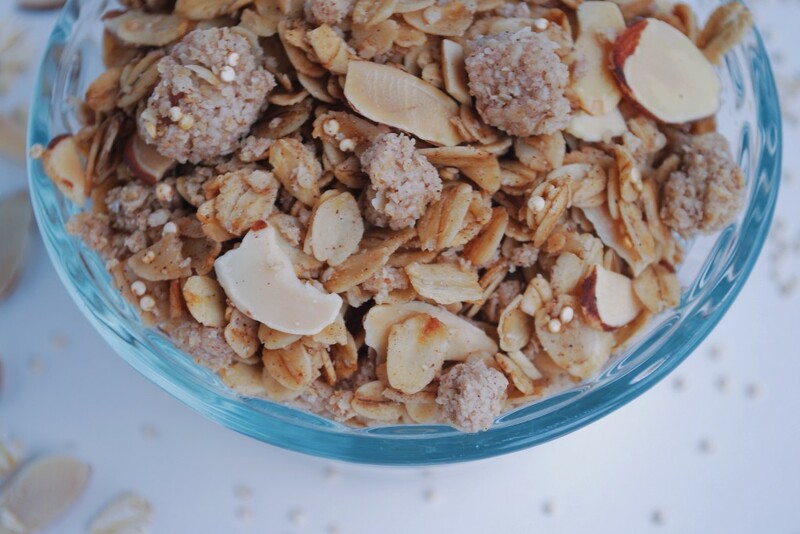 Place rolled oats and quinoa in a small bowl. Stir to combine. Melt 1 and 1/2 Tbsp. coconut oil and add to the bowl. Add 1/2 tsp. cinnamon, 1 Tbsp. maple syrup, and a pinch of salt. Mix to combine. Make sure to coat the entire oat/quinoa mixture with the liquid. Pour onto prepared baking sheet and bake for 15 minutes, giving the mixture a stir every 5-10 minutes. After 15 minutes, add crumble and almonds, then return to the oven for an additional 15 minutes. Continue to stir every 5-10 minutes. Remove from oven and allow to cool at room temperature. I threw another pinch of salt on top as it came out of the oven because I like salty granola, but omit if you'd like. Mixture will crisp as it cools. Recipe heavily adapted from Sally's Baking Addiction. Oh my word. This looks so amazing! I’ve never made granola before, but this is definitely tempting me to try it! Oh, Deanna! It is SO easy! In just a few minutes your house will be smelling all wonderful and baked good-y. Let me know if you do give it a try!